HobbyTron.com was founded more than eight years ago as a niche retail provider for enthusiasts of electronic kits. Its founders had planned to start small and grow the business slowly, being careful not to make huge jumps too fast. However it was not long before the company reaped the financial benefits of offering remote control toys and airsoft guns, in addition to its electronic kits. In only a short time, the site was to become the most successful customer of leading toys wholesaler World Trading 23 Inc., and the two companies recently merged to leverage each other's strengths. 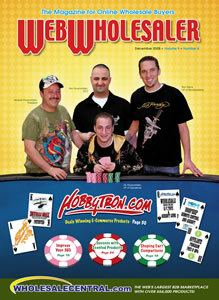 Now, HobbyTron.com, powered by WorldTrading23.com, focuses on wholesale customers that range from mom-and-pop shops to big time chains like Macys.com and Amazon.com. In its first four years, HobbyTron.com amassed more than $10 million in sales and has grown annually by 30 percent, while winning numerous industry awards as one of the fastest growing companies in America. Kev Kouyoumjian, CEO of the now merged WorldTrading23.com and HobbyTron.com, credits the companies' top line of products as the true stars of the story. "We have the largest online selection of remote control cars, boats, planes and helicopters," Kouyoumjian explained from the company's headquarters in San Fernando, California. "In addition, HobbyTron.com offers more than 1,000 different airsoft items. This huge selection in these very niche categories makes us the leader in offering innovative, popular and fun items that enthusiasts want. We now have millions of dollars of inventory, close to 50,000 square feet of space and over 3,000 different items ready to ship." What's more, Kouyoumjian and his team recently unveiled a successful dropshipping program designed to serve both established retailers and emerging entrepreneurs. Retailers who sign up for the dropshipping program can immediately begin selling HobbyTron.com's awesome array of toy products without worrying about the expense of housing and shipping the items themselves. "There is no volume restriction when it comes to order sizes," Kouyoumjian said. "We are going to let people do as little or as much as they want. If a company only sells ten products a month, that is OK. Or, if they only want to focus on Christmas, that, too, is fine." Retailers' advantages at HobbyTron.com do not stop there, especially those companies who deal only online. The new site also provides an excellent affiliate marketing program through the industry-leading Commission Junction. Interested parties can get started in the process by scrolling down to the bottom of the hobbytron.com homepage and clicking the Affiliate Program link. The HobbyTron team does the rest. To put it more simply, marketers can grab a little bit of web code, plug it into their site and offer Hobbytron.com's catalog of products immediately. An ad link can include separate product categories, which will increase site conversions. "If your web skills are more sophisticated than that, you can also download our datafeed of products," according to Kouyoumjian. "With the datafeed, you'll have thousands of items availableto you, but will be able to pick and choose the ones you want to feature. You can redo the descriptions or just put up the 'Buy' buttons. Another possibility for the affiliate program involves banners on your website, and it is all third party traffic through Commission Junction." What products are available for dropshippers and affiliates at hobbytron.com? While there is plenty of inspiration for retailers in the site's thousands of toy items, Kouyoumjian and his team are most excited about their patented toy called The Intelli Heli. And rightly so. At the 2008 New York Toy Fair it was voted "The best small remote control helicopter," on the market. HobbyTron.com's customers must agree, because the toy is currently the company's bestseller. The toy's main selling point is the fact that its multiple channel technology allows it to be flown up and down and in any direction. Additionally, it is the smallest remote control helicopter on the market today. Intelli Heli is half the size of competitors' products and has much greater capabilities due to its technological design. The wholesale cost is approximately $20 per unit, depending on the details of the order. "Remote-control helicopters are the latest craze," Kouyoumjian said. "They have really taken off. Every manufacturer in China has been making them. However, unless you really know the companies you are dealing with, you can end up with some nightmare scenarios. We have heard stories of 30 to 40 percent return rates for some of the remote control helicopters out there. Our products average less than 3 percent for returns, which is a huge difference. Most companies do not offer warranties, either. I want my customers to know that my products come with a warranty." Equally exciting is the second-best selling product at hobbytron.com, the Intelli UFO. It comes with the same appealing and entertaining capabilities of the Intelli Heli, but with the look of a UFO. The wholesale cost is approximately $10 per unit, depending on the details of the order. Meanwhile, airsoft rifle sales have exploded due to the new, friendlier price points for consumers' wallets. "The former expensive metal editions of airsoft rifles were only available to consumers willing to pay $300 to $1,000. With the advances in technology and a combination of metal and plastic, we now have very high quality guns from $80 to $180 that rival the most expensive kinds." The newly managed HobbyTron.com was able to recently garner a lucrative deal for the new Ed Hardy line of toys. The product line has long been in development by Christian Audigier, fashion designer behind the Ed Hardy line, and his items are now hotter than ever. All of the major Hollywood stars are wearing Audigier's clothes, and his Ed Hardy line is the No. 1 seller on Macys.com. The Intelli Heli, Intelli UFO and other great remote control products at HobbyTron.com are now adorned with Audigier's signature designs. Heavy retail hitters, such as Toys "R" Us and Walmart, and etailers of all sizes are already placing orders. "We brought a wildly popular brand to toys," Kouyoumjian said. "We could not be more excited about it. It is going to be a huge product line." It is clear that HobbyTron.com and WorldTrading23.com place a premium on quality, up and down the line. "We travel the world each year to bring the widest selection of remote control toys and airsoft guns to our wholesale buyers and consumers," says Kouyoumjian. "From Hong Kong to Germany to New York City, we hit all the big shows, and work directly with our factories in China as well. We make sure every item we sell is tested at the factory before shipment." Like all great brands, HobbyTron.com powered by WorldTrading23.com reinforces its products with great customer service, and the company stands behind its merchandise 100 percent. Kouyoumjian's knowledgeable crew is populated with individuals who grew up playing with remote control gadgets. Each staffer knows these products inside and out, so when a customer calls with product questions, the team member actually enjoys answering in the greatest detail. When it comes to marketing, the company mainly leans on organic search via Google. In a Google search for remote control cars and airsoft guns, Hobbytron.com shows up number one. Its affiliates also show up on the first search page. "We have the hottest products, the largest variety and we go the extra mile to make sure the quality is great," says the enthusiastic CEO. "We understand the expense of getting a return, so we do all that we can to guard our customers from returns." Furthermore, HobbyTron.com has made sure that viewing products and prices is not arduous for wholesale buyers who come to the site. There is no required login to get a feel for exactly what they are offering, as they display the wholesale prices directly on the site. According to Kouyoumjian, the strength of the site lies in its organization. "We have a lot of products, but we've sorted them in an intelligent manner. Therefore, if you are a dropshipper who adds a category like 'Cheap Airsoft Guns,' to your site, you will get targeted search traffic to your site. People will not only find your site on the web, but they will convert as customers as well." As in any growing company, Hobbytron.com employs a varied array of hard working professionals that make up its cast of characters. While Kev Kouyoumjian is the CEO of both HobbyTron.com and World Trading 23, Inc., he is also an expert buyer, the chief product strategist and product development guru. Also on the roster is Kev's savvy father, Jacques Kouyoumjian, President of World Trading 23. Vic Kouyoumjian, Kev's brother and VP of Operations, runs an efficient and streamlined warehouse and the logistics operations. The company's other buyers, particularly Ben Ibarra and Randy Campbell, contribute substantially to HobbyTron.com's 30 percent annual sales growth. It appears that this mix of varying skill sets has bolstered the companies' success. "I have been selling items online since high school. Randy has 30 years of experience in the science and magic niche. Ben is a younger guy who really understands the products and the market. We each bring something totally different to the table. I think the diversity makes us strong."